When candidates in the recruiting industry are referred to as either being Active vs. Passive, it is referring to whether or not a candidate is actively looking for a job, or a non-job seeker. An Active candidate is someone that is actively looking for new employment. This type of candidate is actively searching the job boards, has their resume posted online, and is highly motivated to find new employment. Most studies indicate that approximately 15% of the workforce is actively seeking new employment at any given time. A Passive candidate is someone who is not actively looking for a new job. While the word passive has a negative connotation when someone thinks of a candidate or employee, it simply means in “recruiting terminology” that the person is not actively looking. These passive candidates are too busy being successful and making an impact for their company to follow the job market and look for positions online. Most companies in their recruiting efforts think that by posting online job openings, they will find the best candidates in the market. The truth is, the passive candidate will likely never see these ads, because they simply aren’t looking for them. In almost all cases, a Passive candidate is considered more desirable than an Active candidate. We are not saying that there are not quality Active candidates in the market, but it stands to reason that if a person is actively looking to change jobs, then there are motivating factors behind it, and those factors are not always positive. Candidates in jeopardy of losing their jobs. Candidates that have already lost their jobs. Candidates that are underperforming in their current positions and are upset because they were passed up for a promotion or didn’t receive a pay increase. Candidates with personality or other conflict issues with their peers and/or supervisors. And a small percentage of candidates that are performing and have other reasons to change companies, such as no growth potential, relocation, etc. The overarching theme though, is Active candidates are easy to attract, not always very desirable, and are typically applying to several positions at the same time. This means that when you find a qualified, active job seeker, you will face substantial competition from all the other companies they have applied to. In contrast, Passive candidates are not actively seeking other opportunities and are much more difficult to identify, locate, and qualify. 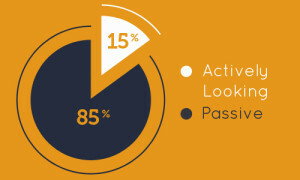 Through our division, Recruitment Intelligence™, we offer a truly unique, research based recruiting strategy, that targets the 85% of Passive candidates in the market. While we still capture the 15% of Active job seekers for our clients, our specialty is uncovering the hidden talent in the marketplace that companies don’t have access to. We not only identify and locate these candidates, but we also call each and every one of them, putting them through a series of qualifying questions, recorded video interviews, and tests to see if they have the skills necessary to fulfill our clients’ positions. Since this is a research based division, we are paid hourly and depending on the complexity of a search, can on average complete a Recruitment Intelligence™ analysis within 40 hours. Our reports contain all of the names of candidates we called on your behalf, ranked by their interest level and their percentage match to the job qualifications. Our reports also include live links to pre-recorded video interviews of the candidates answering interview questions our clients’ have provided, as well as real-time salary analytics, so our clients can see how competitive their pay and benefits are in the marketplace. Recruitment Intelligence™ is a refreshing new approach to recruiting and is saving companies across the U.S. and Canada up to 70% off of traditional recruiting fees. Learn more about Recruitment Intelligence™ here. ARC Group©, has been an industry leader for over 25 years in the full time, contract and temp-to-hire recruiting sectors. Named to the South Florida, Jacksonville and Minnesota’s Business Journal’s list of “Top 25 Executive Search & Consulting Firms” we have offices located throughout the US, including Fort Lauderdale-Miami, Jacksonville, Minnesota and Chicago.